The Very Rev. Peter (Pierre) Beaudoin, CSV, the first Viatorian pastor of Maternity BVM Church in Bourbonnais, Illinois, died of natural causes on Thursday, May 1. 1913. He was 79. He established a legacy of Viatorian pastors leading the parish and school, which still exists today. Fr. Beaudoin, was born August 28, 1833, in St. Paul, near Joliette in Quebec, Canada. In preparation for the priesthood, he studied at Joliette Seminary, which was run by the Clerics of St. Viator. He pronounced his first vows in 1860 and was ordained in 1861. At the command of his superiors, Fr. 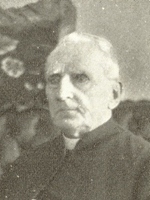 Beaudoin went to Bourbonnais, Illinois in 1865, with Brothers Jean Baptiste Bernard and Augustin Martel to found a school and to assume charge of the parish. He arrived at a time of great turmoil in the parish, after the former pastor had been excommunicated. The acting pastor, Fr. 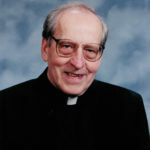 Jacques Cote, resigned his parish to Fr. Beaudoin, believing the Viatorians of Canada would benefit from a religious community that could heal the parish and save the children from the effects of erroneous teaching. Fr. Beaudoin labored tirelessly to strengthen the parish. The school which he first founded, grew to become St. Viator College and received a charter in 1874 from the state of Illinois to confer degrees. Fr. Beaudoin continued to take a keen interest in the college, and later served as president of the board of trustees. He also had been rural dean of Kankakee County. The body of Fr. Beaudoin lay in state in the rectory until transferred to the church on May 4, where thousands of present and past parishioners came to pay their respects. The funeral took place at Maternity BVM Church at 11:30 a.m. on May 5. The Rev. James Edward Quigley celebrated the solemn pontifical requiem Mass. Hundreds of parishioners and the students of St. Viator College and Notre Dame Academy filled the church. Nearly 70 priests were present, who chanted the Office of the Dead, before the start of the funeral Mass. After the service, mourners marched in procession to the cemetery where the remains were placed in the vault of Mr. F. Legris. The Rev. Eugene L. Rivard, CSV, said the last prayers.